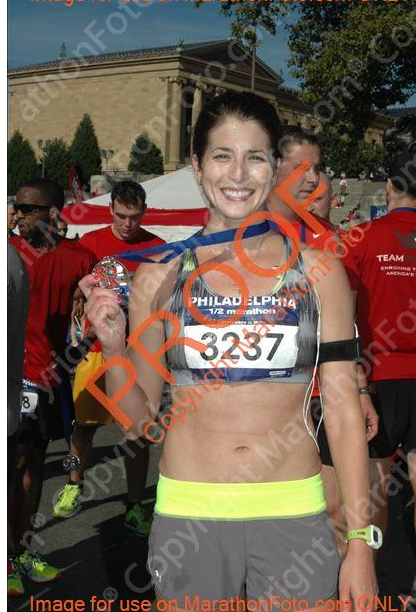 Philadelphia Rock n’ Roll 1/2 – Race Recap! This was a race full of firsts. This was my first time traveling for a race, staying in a hotel and eating at a restaurant for my pre-race meal. All of which I was scared of. All of which turned out really fun and totally in my favor. For the first time I actually slept a full 8 hours before my race. Woke up and had peanut butter on half a bagel, a banana, a water with grape Nuun and a Starbucks coffee. I got to eat and take care of business in the comfy hotel room. I ended up leaving the hotel at 7:25 for the 8:00am start. I did a proper warm up run to the corrals, and did some dynamic stretching. The first 4 miles of the race were through the city streets and it was gorgeous. I felt good, really good. Like, kept looking at my Garmin tick off sub-8 miles in disbelief and tried to slow myself down. When I hit my 5th mile at an 8:01 pace, I thought what the hell, let’s run fast today! So I took my Jet Blackberry 2x caffeinated GU and sped up for the remainder of the run along the river. My legs were hanging in there, my arms were relaxed, head was up and form was good. I focused on my effort to keep pace, more so than my watch. I only checked the Garmin at mile splits. The race finally got hard 8.5 miles in. I panicked and thought I went out too fast, my sub 8s were too good to be true, questioned the last time I ran over 10 miles?? 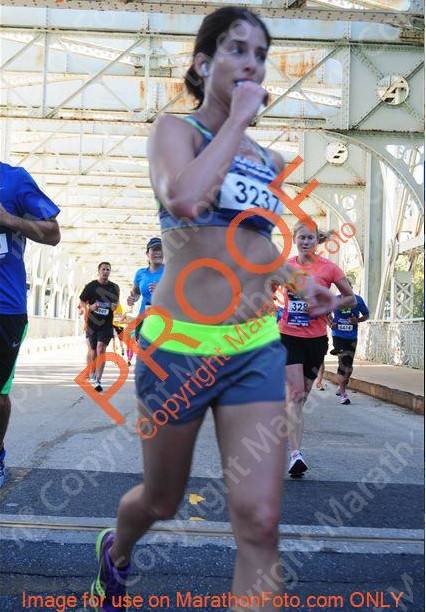 This was the time of the race when my head decided to tell me it was tired. My body wasn’t though, so I shut up my brain and pushed on. The last 3 miles were torture, the hardest of any race i’ve done by far. The sun was hot, my legs were getting heavy and my breathing wasn’t calm anymore. I kept telling myself the last 5k is supposed to be difficult. This is where it matters, one foot in front of the other, take shorter quicker steps and pump your arms. I kept moving, my times slowed slightly, but i wasn’t letting it get me down. I wanted to push until my body quit. Luckily I only had to stop once in the final mile to catch my breath and shake out my legs. I finished with a PR, almost 4 minutes off my last time from 6 months ago and ran a great race. done. and getting blinded by the sun. This wasn’t my ‘A’ goal. I wanted 1:40 so bad, but with my training it was a stretch. I haven’t hit numbers like that to even come close to that time, which is why I’m not upset about it. Coming off of an injury and an abbreviated training cycle (only 8 weeks), I’m really excited about my next races to see what I can really do with a healthy body and full training plan completed. Sidenote–can a girl get a sponsorship from a beer company? or Starbucks? 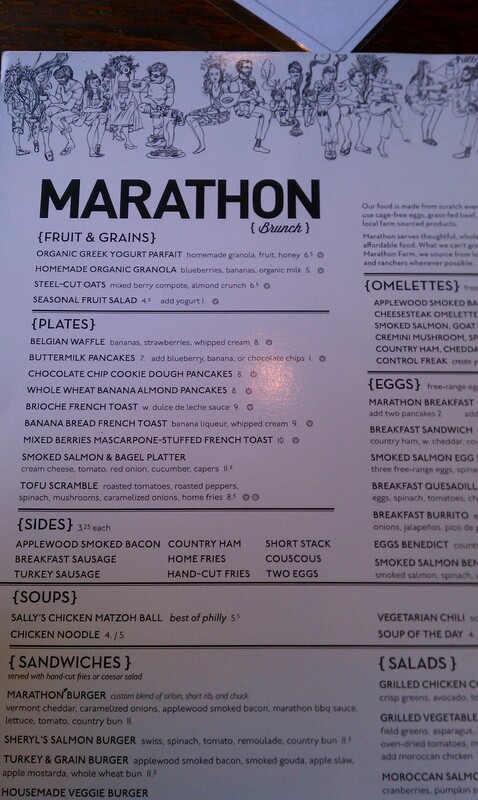 The real fun was after the race when we had a celebratory brunch at Marathon. Seriously. 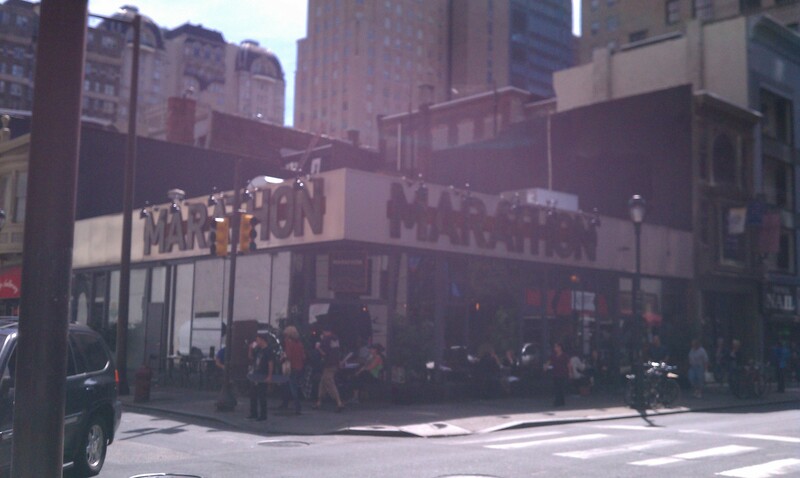 We stumbled upon this gem and I couldn’t believe the name or that it sits kitty-corner to Philadelphia Runner store. Delicious. Everything was grass-fed, organic and yummy. $5 drink specials on mimosas and bloody mary’s, and you bet we took advantage. 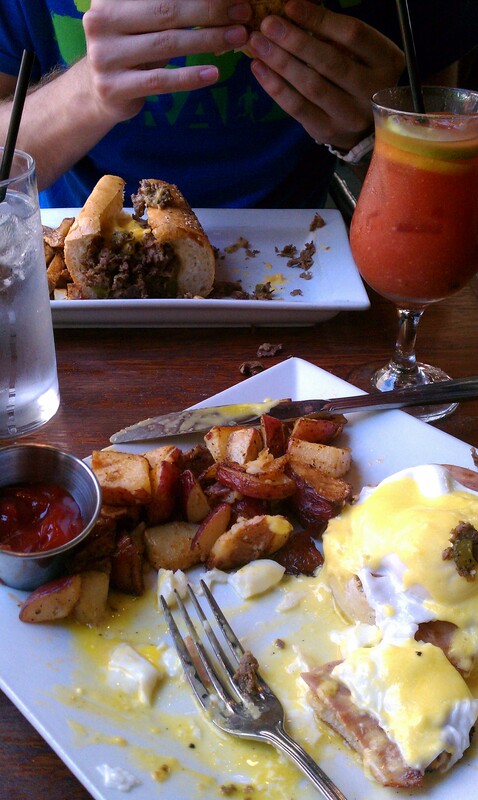 I got eggs benedict & Cameron got the Philly Cheesesteak. My favorite way to explore a city is by running it. And maybe I’m on a big high from my PR, either way, I liked the city and would definitely recommend this race to everyone. It was flat, fast and very pretty. I will be back for sure. 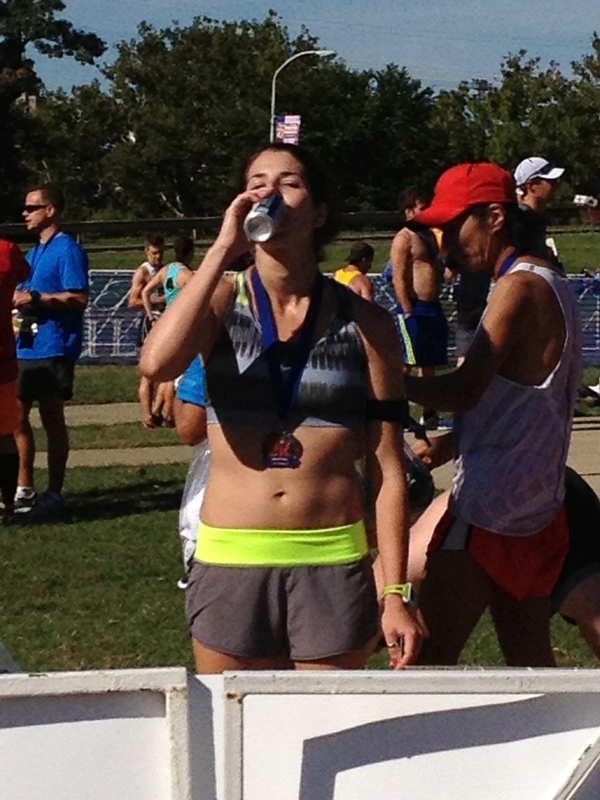 Categories: Uncategorized | Tags: half marathon, Philadelphia, race, rock n' roll | Permalink. Congratulations on the PR – awesome! 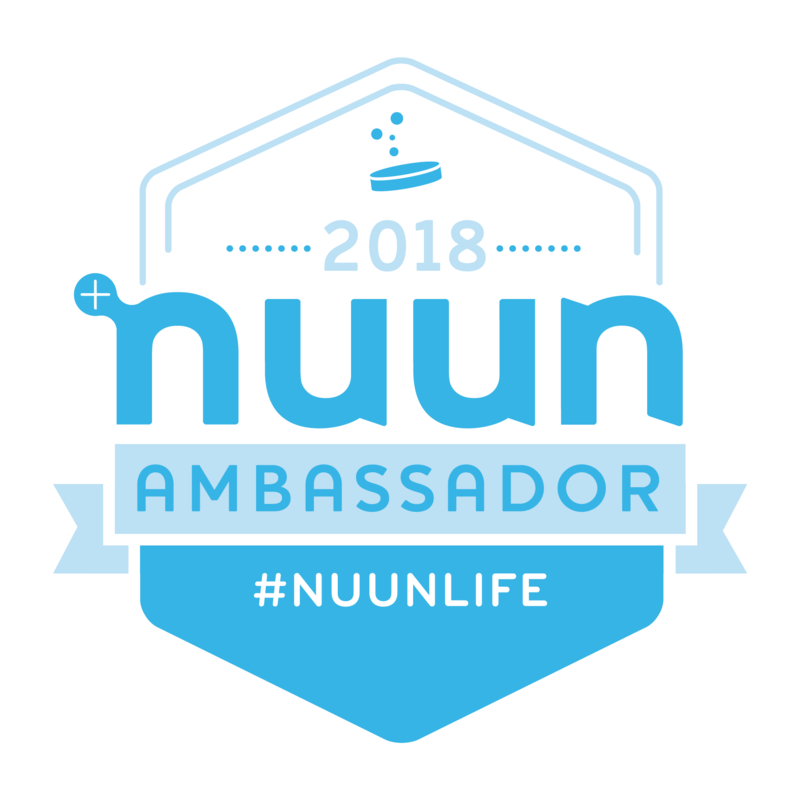 Just found your blog from Sara’s at Loving on the Run and I’m excited to follow along! Looks like we’re similar runners! Thanks! Yep, I set my 1:39 half PR last October, and I’m not in that shape anymore but trying to get back! Nice! 1:39 sounds like a dream right now, congrats! i’ll get that sub-1:40 if its the last thing i do. Oh you totally will! When I ran my first half in 2008 (I think? 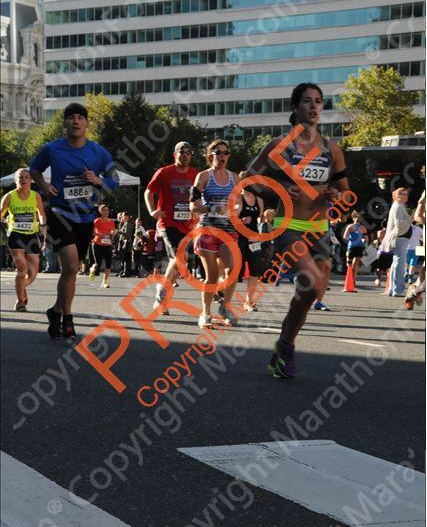 ), I was so thrilled to finish in 2:18, and my goals have kept getting faster since then. 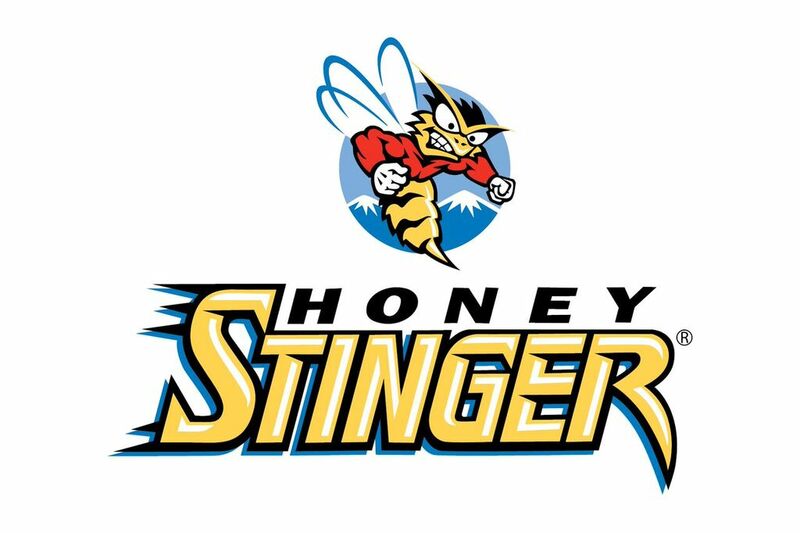 What helped me last year was running a LOT of half marathons (I probably did 7 last year) because it took the pressure off … I hate that feeling of “AH I’ve been training for 6 months for this ONE chance, so multiple races in a season helped avoid that. I’m going to try again this year! Last comment :). Just saw we both ran Chicago Marathon in 2011 … OMG such a miserable race for me! I seriously doubted if I would finish and ended up running another marathon 3 weeks later. Another marathon is in the back of my mind for late winter … just not sure! haha you can comment all you want! and oh my god my first 1/2 was 2009 and i did it in 2:24, our race life is pretty similar! i love chicago marathon (even though it was rough), i’m hoping to run it next year, and yes, more 1/2s and a few fulls are definitely on the horizon. Just gotta start picking them out.